Ever since digital cameras took decent video I stopped carrying around my DV video camera and instead use my point and shoot digital camera to take a few minutes of MOV or MPG video here and there. The only problem is my digicam is not equipped with a light to brighten up the videos I take indoors. There are some small LED lights you can buy online that attach to the 1/4″ hole under you camera, but they cost from $30 to $40 and create a spotlight on your subjects. They also use SIX coin cells and only last 4 hours. I’d rather have a small light that uses rechargeable AAA’s and lasts longer. Now you can make your own that lasts about 12 hours. This concept for this project is very simple. 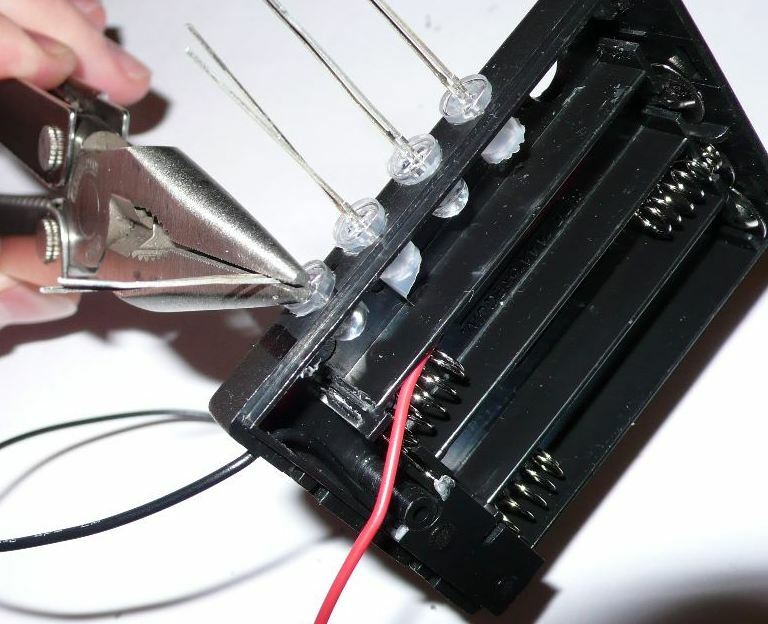 You are going to connect 4 white LEDs in parallel to a resistor and battery pack and then mount it to your camera using a 1/4-20 screw or bolt. The trick is to get all the parts to fit neatly inside the pack. The original post can be found here, but the following instructions are up to date, concise, and with better photos. If your kit is missing any of these parts please contact me for support. It does not include the 1/4-20 screw that you will use to mount to your camera. You can choose from a variety of styles at your local hardware store. I would recommend using a 1/4-20 cap screw or hex bolt that is 0.75″ long. A cap screw is probably a better approximation to a thumb screw that we are trying to mock up. You can find these in packages of 2 for 88 cents. It’s more expensive but creates a more comfortable thumb screw. -13/64 drill bit – a bit larger than an LED but you’ll use glue or tape to hold it in place. -Power Screw driver – I used this as my power drill, its smaller and easier to hold as long as the drill bits you use have a hex socket. 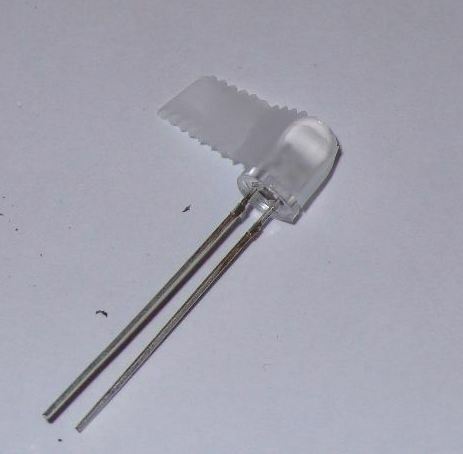 -3/16 Drill bit – to have the LED stay in position without glue you can use a 3/16 drill bit to make your LED holes undersized and then use a knife or flat screw driver to enlarge the hole to fit the LEDs tightly. 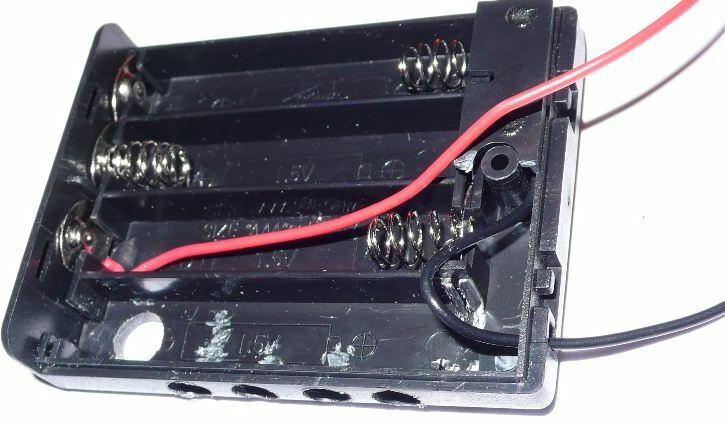 This battery holder is great because it has a cover and comes with a switch. This is going to house your batteries and LEDs. 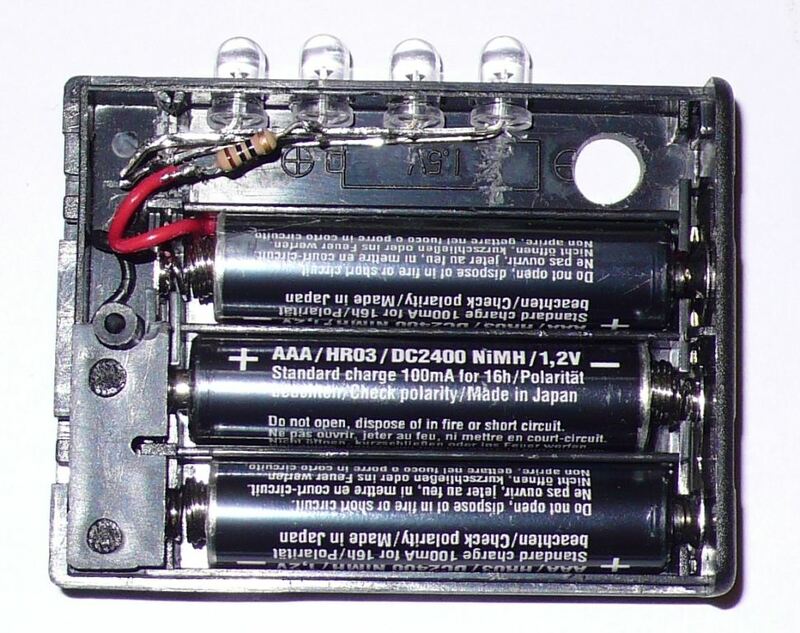 This holder has chambers for 4 AAA batteries but you only need 3 to run these lights. The other chamber is going to give you room for your LEDs and your mounting screw. So we will have to rearrange the battery contacts and wires. 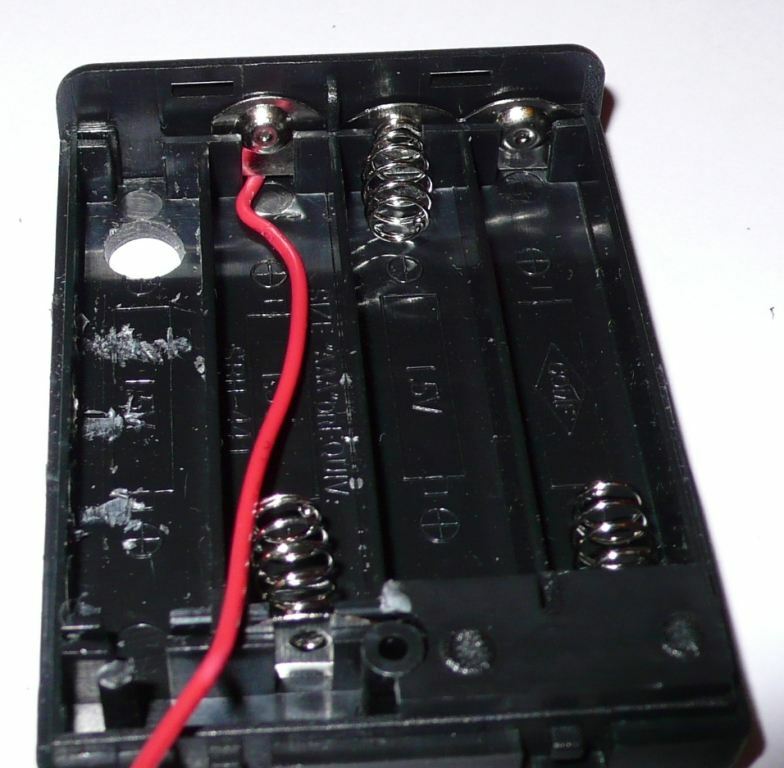 Depending on what battery holder you are using there may be a plastic cover over the switch and battery contacts. You’ll have to remove at least half of that to get started. The plastic sheild is held in place by three plastic posts that were melted over. Use your drill to drill out the melted plastic post nearest the wires. You should be able to lift the plastic and break it in two. 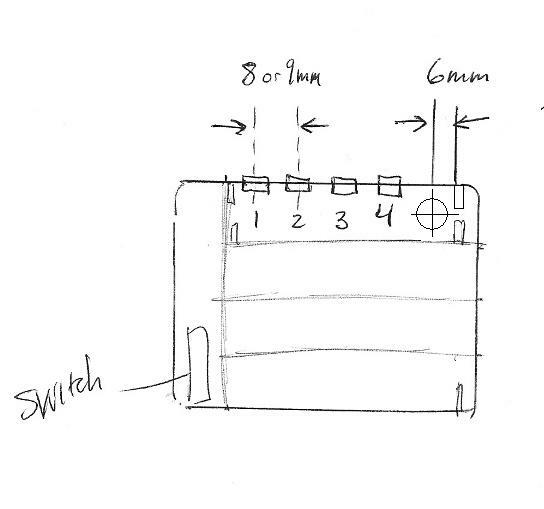 And you are left with a covered switch with two exposed battery contacts. 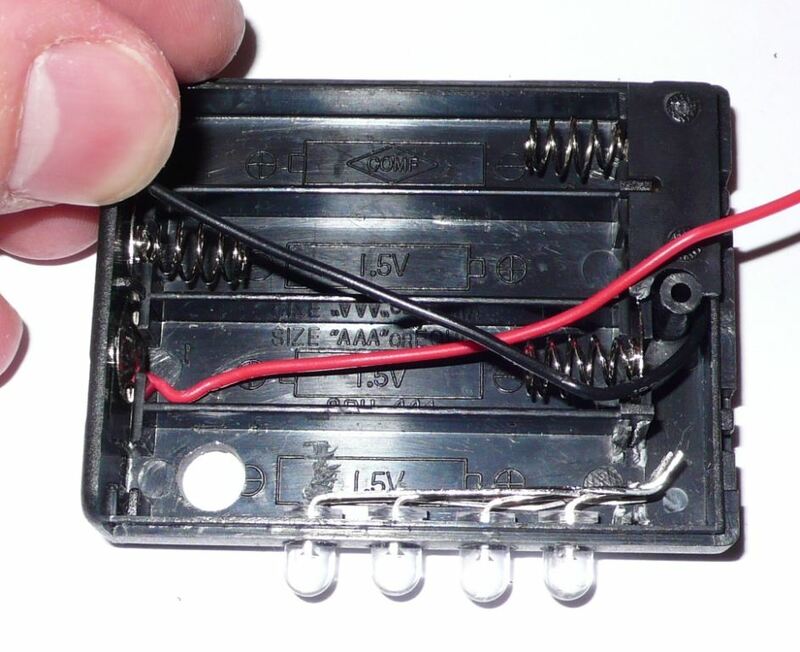 Now you are going to remove the spring contact at the opposite end of the wires as shown in the photo below. You can use a small screwdriver to do this. Insert it through the spring and lift straight up. You may also have to lift under the positive contact to lift the pair out of the holder. Plan out the hole locations using the image below as a guide. I recommend locating the screw hole about 6mm from the walls edge. This leaves enough room for the 4 LEDs. You can use a knife or screw driver to mark 6mm from the wall edge as shown. Then you can use the minus sign “-” to help guide you to the middle of the chamber. To make sure you drill your hole in the right spot, start with the smallest drill bit you have preferably 1/16″, then work your way up gradually to the 1/4″ drill bit. If you dont have smaller bits try to push a pin or nail into the hole location. This will help guide the drill bit and keep it from “walking”. To drill into plastic you should use a the slow speed setting of your power drill, otherwise you might melt the plastic. If you don’t have calipers or find it hard to measure 6mm in the holder, you can try to make a template for yourself by using the dimensions of the chamber which are 10.4mm x 46.2mm. Then mark the hole location with a vertical and horizontal line 6mm away from the side edge and 5.2mm from the bottom. After the hole is drilled try to pass the bolt through. If its seems tight try screwing it into the hole. This actually works to your advantage as it will keep the screw in place when its not attached the to camera. If you feel it is still too tight you can try using the 1/4″ drill bit again to make it bigger. 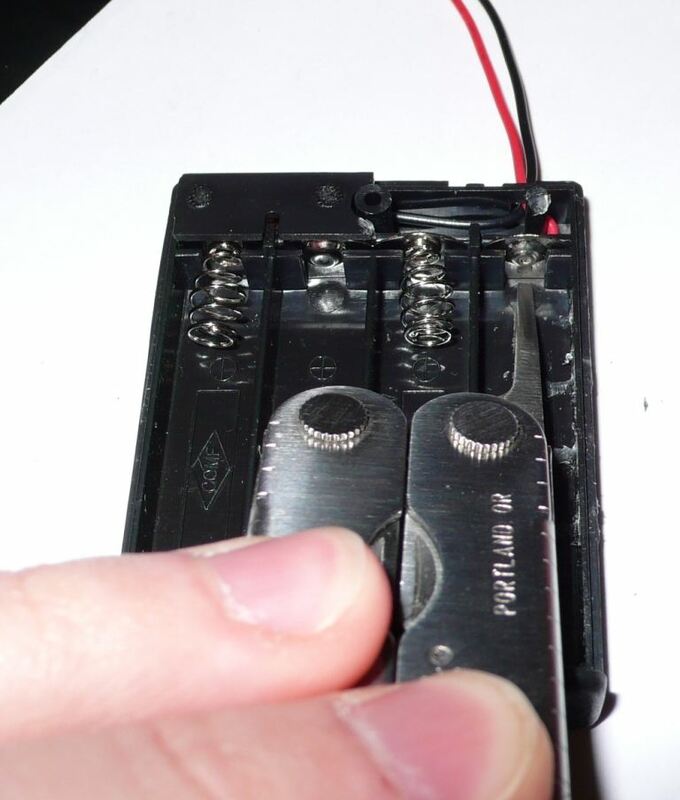 Then close the battery cover and use this first hole to guide the location of the second hole you make in the battery door. You can start with 1/4 drill bit only to mark the location. and then finish with the 1/4 drill bit. While the wires are off to one side prepare to drill holes for the LEDs. Since the LEDs are 5mm you want to measure 2.5mm from the lip of the case as an easy way to keep things centered. Mark that with a knife or pen. Using this guide to decide where the four LEDs should go. Start with one farthest from the screw hole (closest to the wires) and space the other three about 8-9mm apart. You can also make a paper template to help you mark the locations. In fact you can even tape the template to your holder and drill through it. Again start with small drill sizes. Here are 4 holes drilled with a 3/16 drill bit. This will be a very tight fit for the LEDs. You can try opening the hole a bit with a knife or flat screwdriver until you achieve the desired fit. Or you can just use a 13/64 drill bit to manually enlarge the LED holes. Test the fit with an LED. If you used the 13/64 bit it will feel loose. 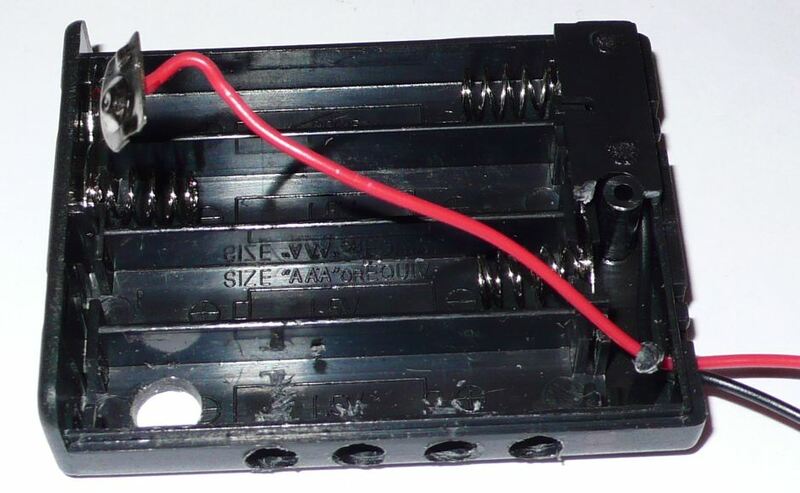 Now you have to move the positive contact and red wire to the other end for your third battery. Take a thin flat screw driver and pry under the positive contact until it loosens. 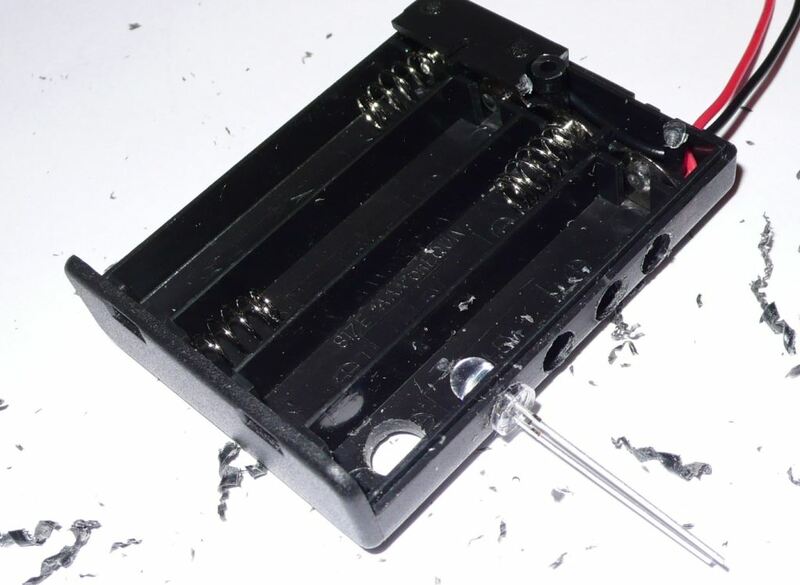 You may have to also insert the screw driver vertically between the contact and the plastic housing wall to loosen it up the locking tab. 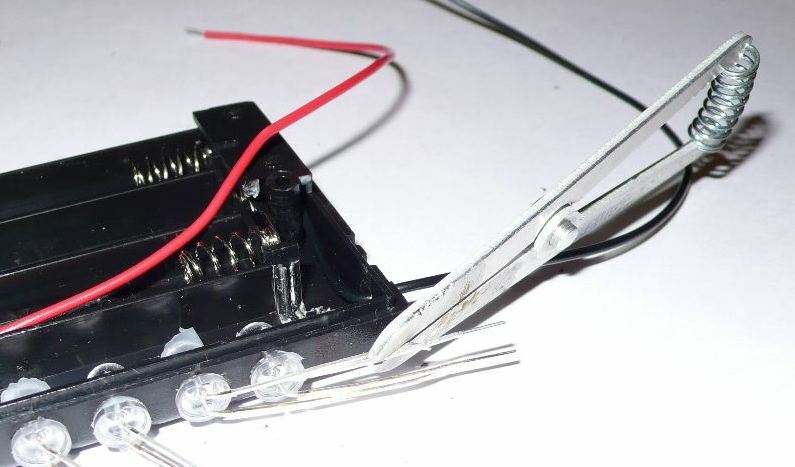 Now you will insert this contact and red wire to the other end of the case opposite the switch to complete the circuit. 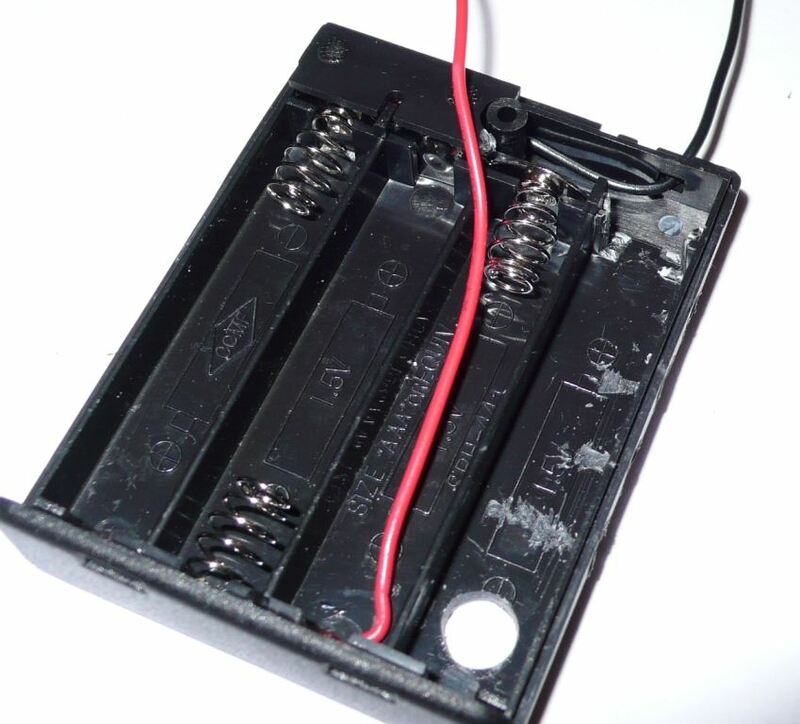 Feed the wire into the battery chamber. 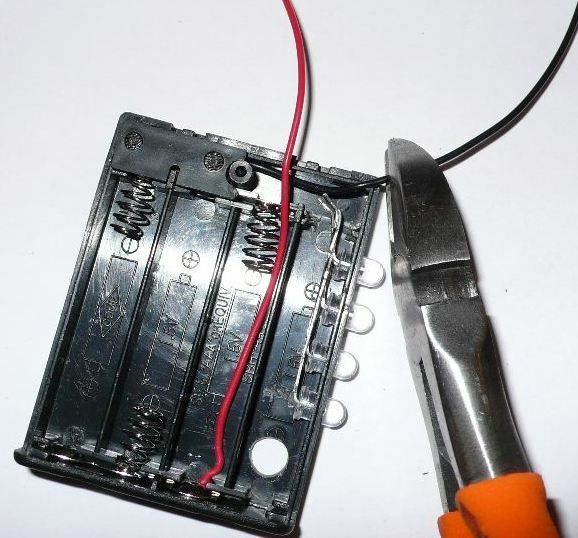 Run the red wire to the corners like shown to make room for the battery. A small screw driver or thin blunt object helps. Be careful not to cut the wire or break the insulation. 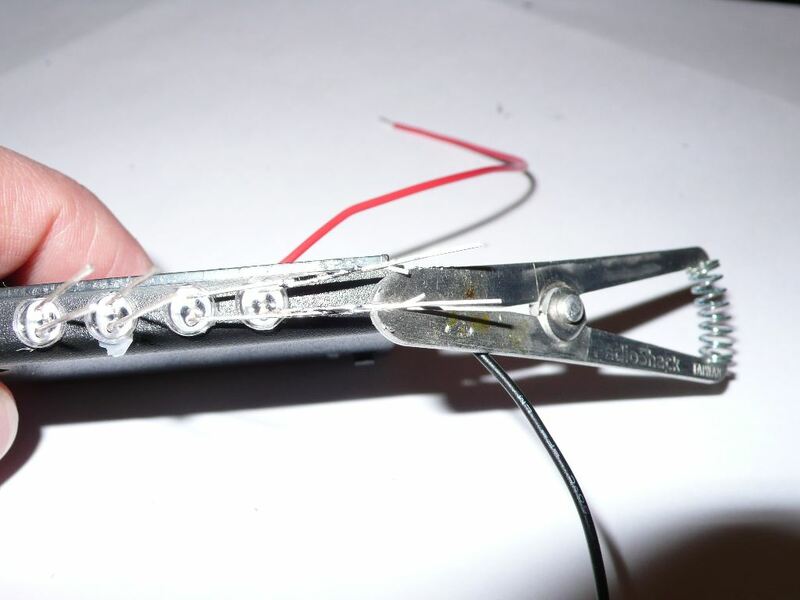 Your LEDs will be soldered together in a parallel circuit. 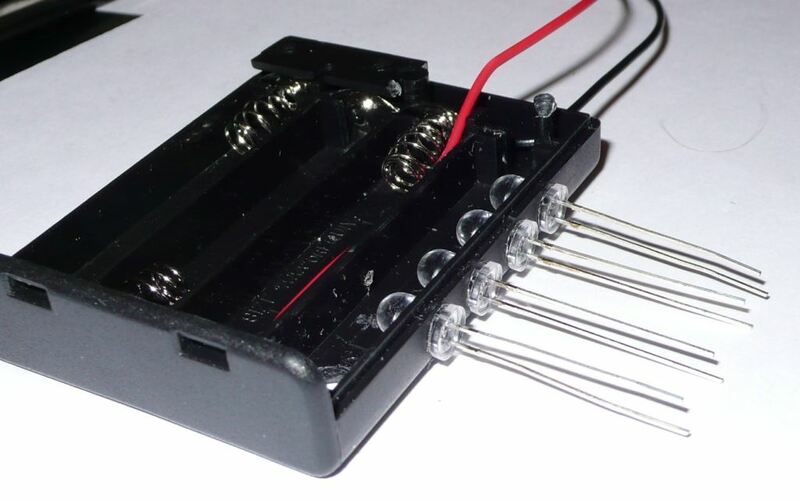 Your kit will include one 10 ohm resistor which is chosen to work with 3 NiMh rechargeable batteries. 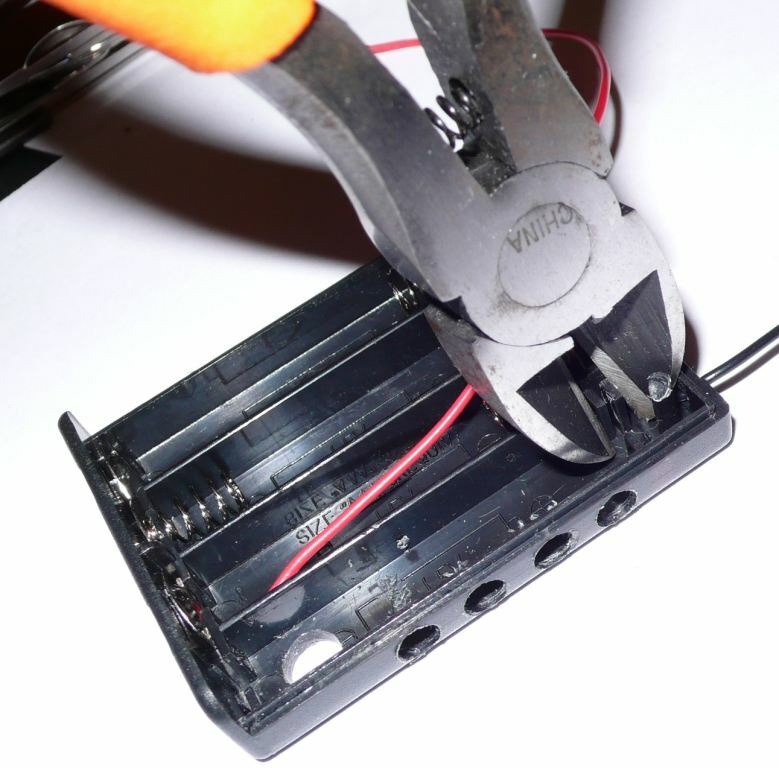 NiMh batteries are 1.2V each which should equal 3.6V but the voltage of batteries that are newly charged are higher than 1.2V per battery. The total battery pack value can be as much as 4.1V for fully charged 3 NimH AAA cells. This circuit is not voltage regulated so the battery voltage will start high and decrease over time. This means the current will start high as well. 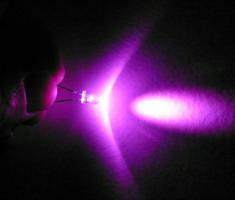 To protect the LEDs from burning out we need to limit the current to each LED to 20mA. So (4.1V-3.3V) /10 = 0.08A or 80mA. Since there are 4 LEDs we can assume each is drawing 20mA. Where 20mA x 4 = 80mA. This circuit was chosen because it uses the least number of components (one resistor) and is simple to construct. Our calculation assumes each LED has the same forward voltage but in reality they can differ by as much as 0.4V. A better parallel circuit would be one where each LED has its own resistor based on that LEDs forward voltage. But for the purposes of this inexpensive and easy project a single resistor design is adequate. Lets make room by cutting away some unnecessary plastic. Remove the plastic near where the red contact used to be and the plastic post. Use the holes in the casing as a makeshift fixture to hold the LEDs in place while you solder the LED legs together as shown in the photo. 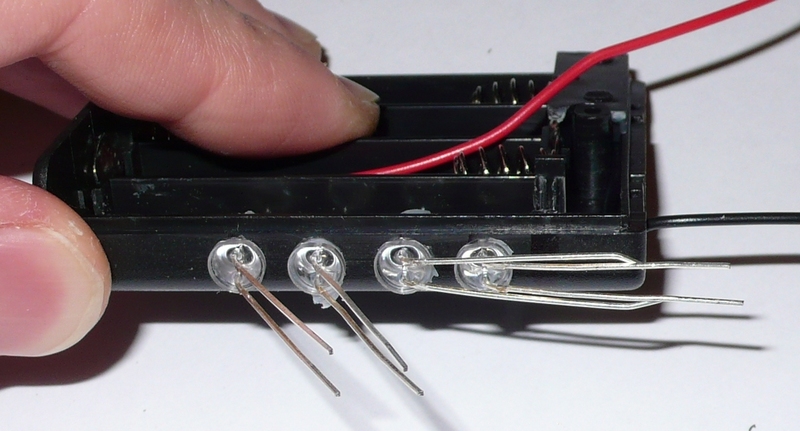 This helps keep the right distance between each LED while they are soldered together. If you used a 13/64 drill bit or if the LEDs are loose. 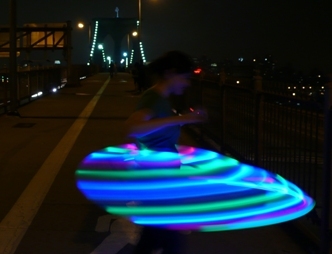 Wrap one layer of scotch tape around the LED to increase its diameter and help keep them in place. it doesnt take much tape. Keep the LEDs in the same orientation so each positive leg will connected to the next positive leg, and each negative leg is connected to the other negative legs. Interlock the LED legs so that they stay together for soldering. You can also use a pair of spring clamps or alligator clamps. Solder one set of legs at a time. And it looks like this. Don’t forget to remove the scotch tape. Pull out the black wire. Trim off some of the LED leg length and bend it slightly before inserting it into the holder to test the fit. DO NOT push on the legs, they will bend and you might create a short. Try to push only on the plastic part of the LEDs. Be sure to keep track of which side is positive before trimming legs!! If you followed the photo example your positive leads should be on top. Cut and strip the wire to the desired length. Now all that is left is to connect the wires and resistor. 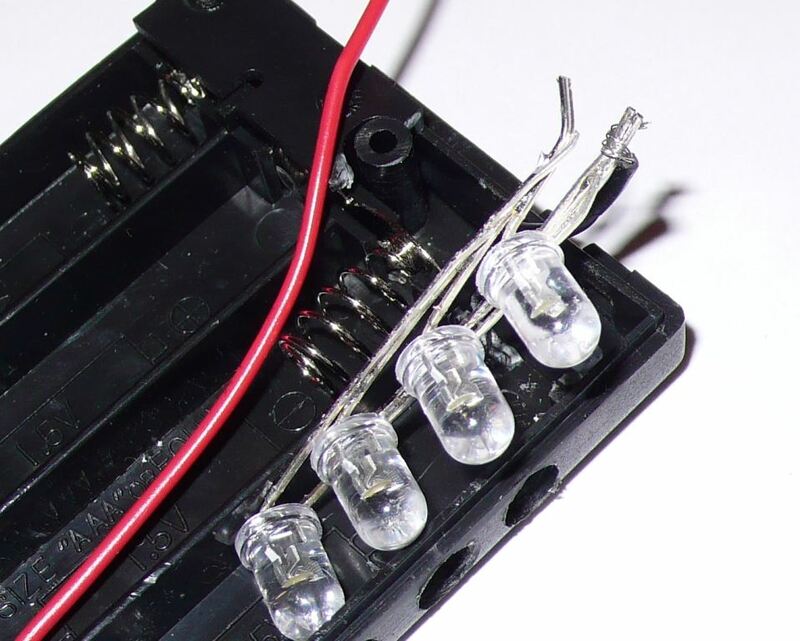 Pull the LED set out of the holder and wrap the black wire around the bottom legs as shown. Solder the wire in place outside of the holder so you don’t melt the plastic. Wrap the resistor around the top legs as shown and solder in place. Cut the red wire to length. Solder the red wire to the resistor making sure the red wire does not touch the LED leg directly. You can insulate the exposed solder joint with electrical tape if you want. 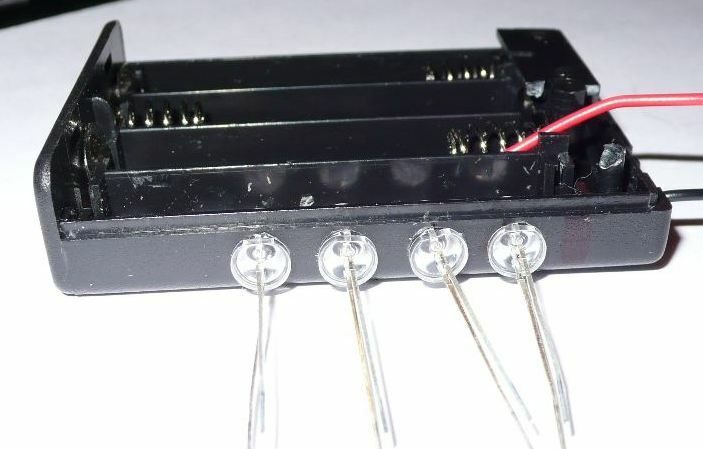 Make sure the positive and negative legs of the LEDs do not touch. Trim any excess leg length. Push the red wire to the side of the wall to make room for the battery. Insert Batteries and close cover. If the lights are working fine you can choose to hot glue the LED and wires in place. Now get out there are test your new product. 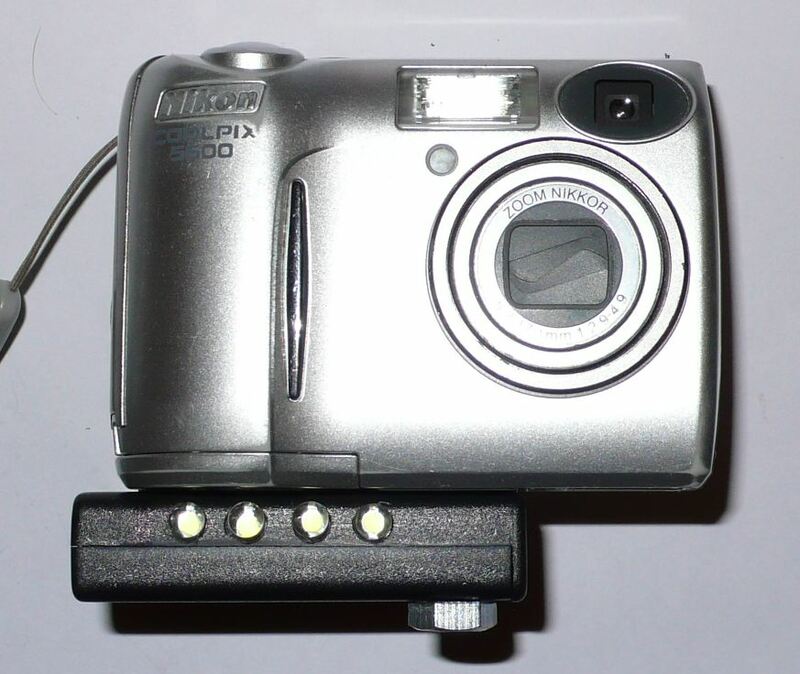 It is best used for taking video with digital cameras in the dark. But you can also use it to add extra light for a photo or help your camera autofocus. Remember you can attach this to anything with a 1/4-20 socket, that means your SLR camera (film or digital), Video cameras (Film, or Digital). Send your photos to prodmod and be included in our gallery. You are not really finished, are you? There is always more you can do with a DIY project. You can mod this ProdMod, in fact it is strongly encouraged. Maybe you want to hide the screw inside the holder? Maybe you want to add a dimmer? or use fewer batteries? Check out these photos and links for inspiration. A convenient way to build the screw stud into the body. Rotate the entire light to screw and unscrew. Try these store bought thumb screws if you want a more polished look. Who says you need 3 batteries to get 3.6V? 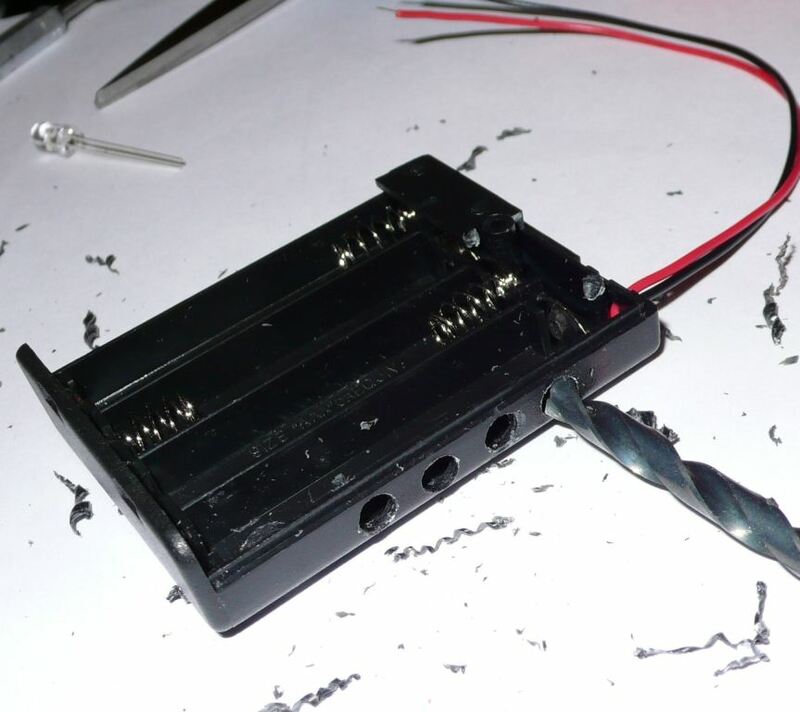 Use a DC Boost to produce regulated 3.3V or 5V with only one or two batteries! Now your lights dont dim over time. Center Mounted Screw - a fine example of modding the ProdMod. This is a great tut. How would I make a really large canaster version that runs on AC (Or a few big 6volt saure D batterires)and has a seperate stand to use with indoor Video Shooting?